This is an operation to replace the worn surfaces of the ankle joint. We use an Infinity / in bone Wright medical replacement. Ankle replacements are done for arthritis of the joint. The causes of this are a previous injury that has damaged the joint (post-traumatic osteoarthritis), or a generalised condition such as osteoarthritis or rheumatoid arthritis, or another type of inflammatory arthritis. In these situations an ankle fusion would be advised instead. This would permanently stiffen the ankle, but will usually reliably relieve pain. 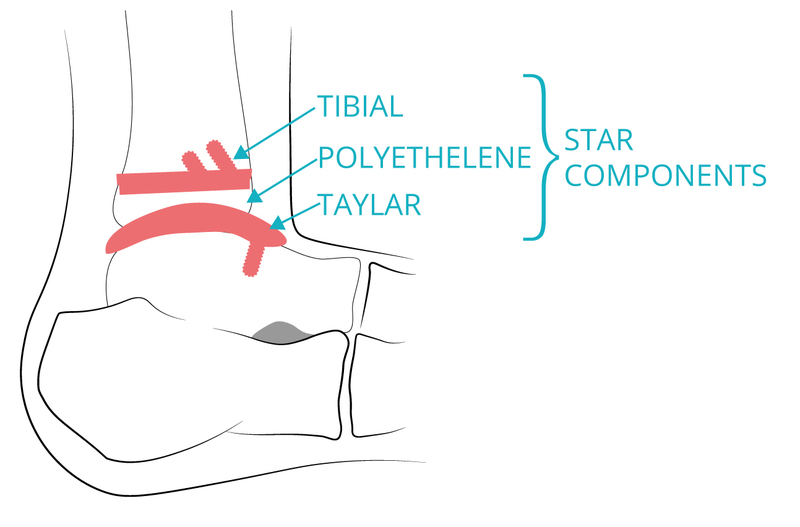 If you have a severe foot deformity you may be advised to have a fusion of the joint below the ankle (the “sub-talar” joint), followed by an ankle replacement. Do I have to have the operation? The operation is usually only recommended when other forms of treatment have not relieved symptoms sufficiently. These treatments may include simple painkillers or anti-inflammatory tablets, splints or insoles, and physiotherapy. The operation can be done under general anaesthetic (asleep). Alternatively, an injection in the back can be done to make the foot numb while the patient remains awake.Your anaesthetist will advise you about the best choice of anaesthetic for you. A cut about 12 cm long is made on the front of the lower leg and ankle. The joint is opened up and the surfaces removed and shaped to fit the metal parts of the ankle replacement. The metal implants fit onto the bones without cement (press-fit) and are coated with a chemical called hydroxyapatite, which encourages the bone to attach to the metal. A hard plastic bearing fits between the two metal components to allow movement. If the ankle is very stiff then the Achilles tendon may be lengthened. Dissolving stitches are used and a plaster splint applied to keep the ankle still during healing. After surgery your foot will tend to swell up quite a lot. You will therefore have to rest with your foot raised to help the swelling to go down. A plaster back-slab (half-plaster) is put on your leg at the end of the operation. This will be changed after 2 weeks to a boot. The physiotherapist will teach you how to walk with crutches. We will get you up as soon as possible! Most people are in hospital for 1-2 days. By the time you go home you will have mastered walking on crutches (or a walking frame) non weight bearing for 2 weeks. At this stage your plaster will be removed and the cut and swelling on your foot checked. If all is well you will be given a boot and referred for some physiotherapy to help you learn to walk again. If the wound is not sufficiently well-healed then you would be put back into a lightweight plaster for another couple of weeks. As explained above, you can gradually walk on the foot from 2 weeks as comfort allows. If your foot is comfortable, and you can keep your foot up and work with your foot in a special shoe, you can go back to work within 3-4 weeks of surgery. On the other hand, in a job which involves a lot of standing and walking, you may need to take about three months off work. How long you are off will depend on where your job fits between these two extremes. After your plaster is removed you can start taking increasing exercise. Start with walking or cycling. Ankle replacements are quite delicate and will not withstand heavy impact or great stress. Golf and gentle tennis may be possible, but more energetic sports are not advisable. Many people find that because the foot is more comfortable than before surgery they can do more than they could before the operation. Most people can walk a reasonable distance on the flat, slopes and stairs, drive and cycle. The most serious thing that can go wrong is infection of the ankle replacement. We take great precautions to prevent this, such as the MRSA-protected ward, antibiotics around the time of the operation and an operating theatre with specially clean air. Despite this, about 1-2% of people having joint replacements get an infection. This can be very serious, as further surgery to clean out and possibly remove the infected joint replacement may be necessary. You may then need yet more surgery to get the ankle to fuse in a satisfactory position. An ankle replacement is technically a difficult operation and occasionally a fracture of the ankle may occur during the operation. This may need to be fixed with screws at the time or may need extra time in plaster. There are small nerves that are moved to one side during the operation and it is not uncommon to experience some numbness in the foot afterwards. This is usually in the great toe. It usually recovers in time. Major complications involving the circulation to the foot are very rare, but these could be very serious. Ankle replacements can wear loose. This can happen soon after the operation if there has been a technical problem or if the ankle has been subjected to too much stress e.g. jumping, heavy digging, etc. More commonly it happens much later and is recognised by increasing pain in the ankle some years on. The long-term figures show that about 85-90% of ankle replacements are still going well after 10 years. The majority (90-95%) of patients will have a comfortable ankle at rest and for walking, although many will experience some twinges or aching from the joint. The range of movement does not return to normal, but will usually be improved by the operation. People who have a very stiff ankle before the operation tend to have less improvement in movement.Overall most people are very pleased with their new ankle!